Is It Too Late to Plan A Summer Wedding for 2019? Summer Wedding Season in 2019 Will Soon Be Here! We are certainly not ones to wish our lives away, but we do know that when you are planning a special event – you really can’t leave things to the last minute. 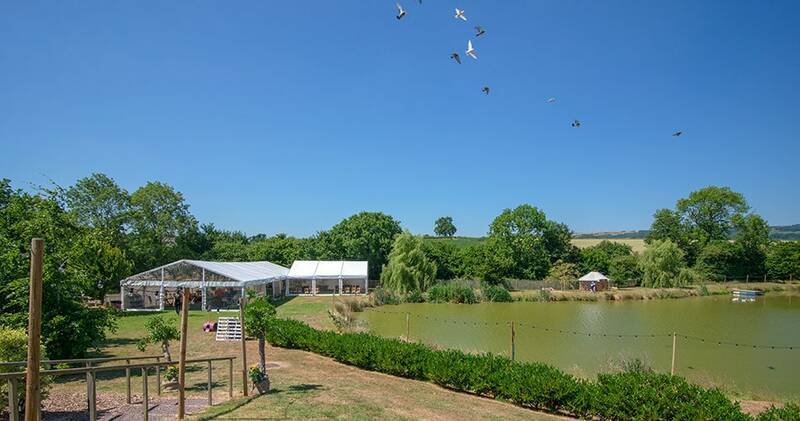 Summer 2019 may seem like a long way off right now, but we have already started to get enquiries for our marquees for 2020 summer weddings! So, if you haven’t already – there’s no time like the present to reserve your wedding marquee. To book your marquee and choose all of the interior furnishings for 2019 summer weddings you need to act fast! How Do I Book A Marquee For My Wedding? Initially we ask a few simple questions like the date, number of guests and location of your reception/wedding party. Then we can check availability before booking a site visit. You can use our quick and easy marquee quote form or just give us a call on 01934 713198. Do I Need A Site Visit For My Marquee Wedding Party? We almost always like to visit the site where the marquee is proposed to ensure that it is suitable and also to measure and check what size will work for your event. The only times we won’t arrange a site visit is if the location is known to us or if you have provided accurate photos and measurements of the site that we are certain of. Sometimes uneven or sloped ground can be an issue but we often have ways of getting around this. We also check for site access and best positioning options for the marquee and things like the toilets, catering tent, dance floor etc. Our main aim is to ensure that your wedding day runs smoothly and is full of love and fun with no last minute problems. A site visit will ensure that there are no nasty surprises and will help you relax in the run up to the day! What’s The Most Popular Month To Get Married? The busiest months for weddings are always May, June and July. August, although still popular sees a slight decline as many people take holidays. September and early October are also still very busy for us. If you are keen to get married on the weekend, then it is very wise to get all the key elements of your wedding such as the venue and the marquee booked as far in advance as possible. How Many Guests Can I Invite To A Marquee Wedding? Our marquees are very versatile and can be configured in many shapes and sizes. We can hold weddings and wedding receptions for parties from 20 up to 2000 guests. If you have a very large group of friends and family, then marquees are the perfect space for your celebration as we can make them pretty much as big as you need by linking frames together. The smallest marquee we provide is 3 metres by 3 metres which is generally used for entrances, cloakrooms or for trade stands at events. The largest marquees we supply are 15 metres wide and can be linked together to create huge open plan areas which benefit from no central support poles or unsightly and possibly hazardous guide ropes. What Is A Clear Span Marquee? Clear span marquees have become increasing popular in recent years. A clear span marquee has sides and/ or ceiling in a clear finish so you can see right through it. These structures are fabulous for making the most of your surroundings as they very much bring the outside in but still offer protection from the elements. 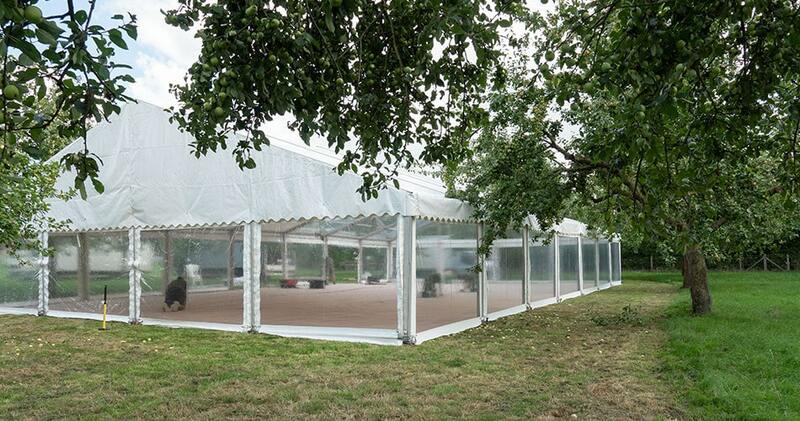 Clear span marquees can be incorporated with covered and lined areas of marquee too. If hot weather is forecast, we recommend having a combination of the two to provide your guests with some shade and a little relief from the direct sunshine. We have may options when it comes to your marquee design so drop us a line to start planning. Do You Offer Marquee Hire In My Area? We’d love to help you with your wedding marquee for 2019 or beyond. We cover all areas of South West, South Wales, Southern England and London too. Please contact us today, we offer free advice, consultations and site visits to ensure your wedding days goes off without a hitch! Here is a list of the counties where we offer marquee hire services: Somerset, Dorset, Devon, Cornwall, Wiltshire, Gloucestershire, Hampshire, Hertfordshire, Oxfordshire, London, Surrey and Sussex. We also provide marquees to South Wales.